Why would my son/daughter buy illegal tobacco? I can't believe shops would sell illegal tobacco. Will I lose my job if I get caught selling illegal tobacco? Where does illegal tobacco come from? Is legal tobacco better for me? You can give information anonymously with full confidence it will be taken seriously. Information given by people like yourself helps Trading Standards to take more illegal tobacco off the streets. 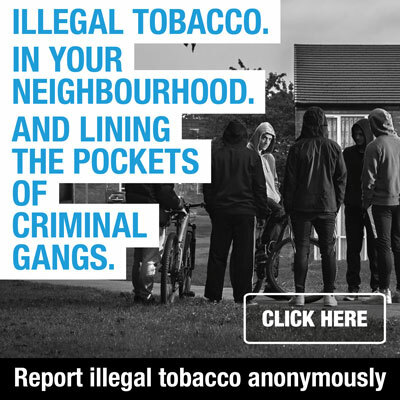 Illegal tobacco is an issue that affects everyone who doesn’t want their children or grandchildren to start smoking, or who wants a crime-free neighbourhood. Illegal tobacco is sold in a range of different locations. Most commonly they are sold from people running ‘Tab’ houses (houses that sell smuggled/fake tobacco), and a small minority of shops prepared to break the law for a small profit. They can also be touted in pubs and clubs, car boot sales, tanning salons, ice-cream vans, workplaces or on the street. They can also be sold on the internet. Criminal gangs are known to target vulnerable, cash-strapped families by paying them to travel abroad and smuggle illegal tobacco back into the country. If you think you know someone who is being taken advantage of in this way, you can report it anonymously. to Trading Standards. The supply of illegal tobacco has proven links to organised crime gangs and dealers can be selling other things illegally. It can also draw buyers into owing money to sellers and get children involved with local dealers. Buying it means supporting a criminal trade. Nobody likes to think about their children trying smoking, and fewer children are starting nowadays than ever before. However, some children do experiment and surveys of children show that illegal tobacco is an easy source for children because 1/ it's cheap and 2/ the people selling it don't mind selling to children, unlike most responsible retailers. Dealers might tell their customers they don't sell to children, but the truth is many do. Most retailers are honest and would not dream of selling illegal tobacco, or selling tobacco to kids. However a dishonest minority are prepared to do both. 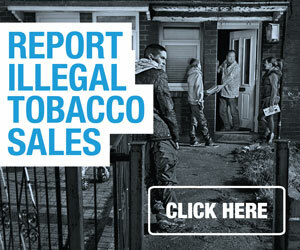 Shops are a source for around 1/4 of the illegal tobacco sales in the North East. If you're a retailer angry about the illegal tobacco trade, then you're right to be annoyed. Anyone who has information can report it anonymously. to Trading Standards. Selling illegal tobacco at work could put your job at risk. In some circumstances, Trading Standards can take action against an employer if it is suspected that they are directly involved and profiting from the sales of illegal tobacco. If the employer is in charge of a licensed premises, he or she may be committing a criminal offence if they allow illegal products to be kept on the premises. Pubs and shops that sell alcohol can also lose their alcohol licence if people sell illegal tobacco on their premises. Most illegal tobacco is smuggled into the UK from Eastern Europe and the Far East. It is then sold in our communities through ‘fag’ or ‘tab’ houses, shops and pubs and even under-the-counter at tanning salons and ice-cream vans. Counterfeit cigarette-manufacturing operations – factories that produce fake fags – have even been discovered right here in the UK. All tobacco kills half of lifelong smokers and contains over 5,000 chemicals, 60 of which cause cancer.